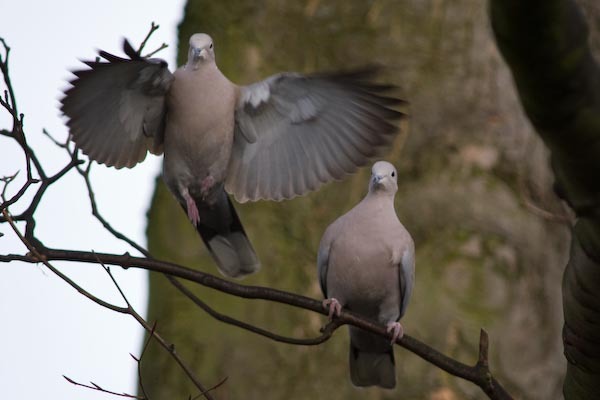 We have had very good results over the past few years with our Collard doves. Originally there were only 2 coming into the garden which is quite normal as they tend to stay in pairs or singly. Because of the abundance of food to be had in our garden they have managed over the last 2 years to increase to 9. I wonder if we could say that we have a flock of them now. They seem to be quite shy and like to stay in the sycamore tree when they are not feeding. We have a bird table which is shaped like a house with a roof and one will land on the top of the roof and others will come and try to stay calm as they slide down the sloping roof. It is very amusing as they slide from the top to the bottom and often have to fly off and start again at the top.